A new partnership between the Australian Hearing Hub at Macquarie University and the Sydney Children’s Hospitals Network will help provide better hearing outcomes for children. Representatives of the Australian Hearing Hub, Macquarie University and the Sydney Children’s Hospitals Network sign a new memorandum of understanding. The Australian Hearing Hub brings together under one roof many of the country’s leading hearing organisations, including Cochlear, Australian Hearing and the National Acoustic Laboratories, as well as the University’s own research and teaching strengths in audiology, linguistics and cognition. Macquarie University Vice-Chancellor Professor S. Bruce Dowton said the new memorandum of understanding with the Sydney Children’s Hospitals Network will formalise strong links that already exist between the two, but also help create new opportunities for collaboration. Sydney Children’s Hospitals Network Chief Executive Elizabeth Koff said she was excited to consider the various teaching and professional training opportunities that would flow from the new relationship. The Australian Hearing Hub, founded by Macquarie University, unites researchers, educators, clinicians and innovators with expertise in Audiology, Speech Pathology, Cognitive and Language Sciences, Psychology, Nanofabrication and Engineering Sciences. 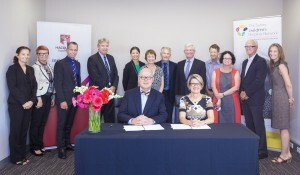 Partners include Macquarie University, Australian Hearing Services, The National Acoustic Laboratories, Cochlear Limited, Royal Institute for Deaf and Blind Children, The Shepherd Centre, SCIC Cochlear Implant Program an RIDBC service, the, ARC Centre of Excellence in Cognition and its Disorders and The HEARing CRC. The Sydney Children’s Hospitals Network is the largest network of hospital and services for children in Australia. Established in 2010, the Network incorporates The Children’s Hospital at Westmead, Sydney Children’s Hospital, Randwick, Bear Cottage, the Newborn and paediatric Emergency Transport Service (NETS), the Pregnancy and newborn Services Network (PSN) and the Children’s Court Clinic. Each year our services manage 51,000 inpatient admissions, 92,000 Emergency Department presentations and over one million outpatient service visits, providing care and key specialised services for children locally, across the state, nationally and internationally.